Festival is a special time for celebration with often one of religious significance. Every person observes the festival at the different time of the year according to their culture and religion. As every year, I enjoyed the Dashain Festival this year with great rejoice with my family. 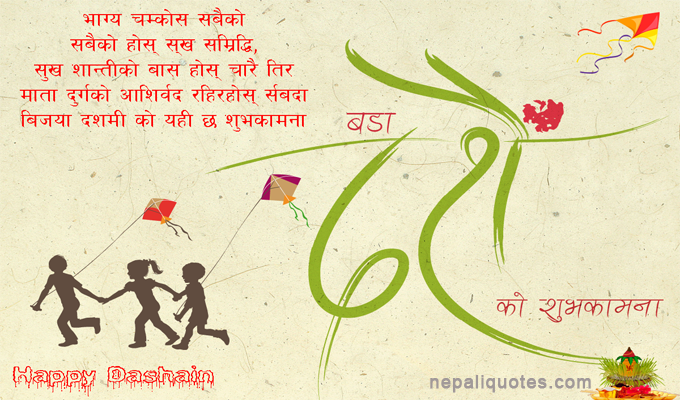 October the month of the biggest of Nepal's national Festivals: Dashain. Starting at the new moon and lasting for 10 days, this is a time for family and Home, a time for gifts and feasts. The "nine nights" –Navaratri- of Dashain are marked by masked dances, and on the eight-night, the "black night", sacrifices are performed by all who can afford one – preferably on a black goat. Another Dashain activity is the erection of swings and primitive ferries wheels at entrances to villages around the country. Dashain is considered the greatest festival in Nepal. It is the celebration of conquest (win) of truth over evil power. Dashain festival is observed in the month of September and October starting from the bright lunar fortnight and ending on the full moon day. On the occasion of this festival, the government provides 15-day long national holiday. It is referred to as Bada Dashain, Dashera, Vijaya Dashami, Etc. Dashain commemorates the victories of the god and goddess over the demons. One reason it is observed is that Lord Ram Killed Ravan, the king of demons during this time in the past. the other reason is Goddess Durga killed Mahashasura, a powerful demon who had created terror in the world of gods. On the first day of Dashain, my grandfather sowed some seeds of maize in a sacred place. from the next day at my home and in the temple near my house different manifestations of Goddess Durga was worshipped. My father bought new clothes and shoes for me and my sister. The seventh day, on 'Phoolpati' one of the manifestations of Durga was worshipped and a goat sacrificed to the Goddess. On the day we invited some guests to our home and had a special feast. Mutton and beaten rice was the special dish on the day. On the tenth day, we put "Tika" on our forehead and took blessings from our elders. I got some money from them as well. Some of my relatives from other district and foreign country also came to see our grandparents on the day. Really this festival can be called the reunion-day as well. During the days of this festival, I had a lot of free time. I had no more worry about my study. Some of my friends involved in gambling activities which actually I didn't like at all. I didn't like the way to worship the god and goddesses. nepali Dashain, Nepali Dashain wishes, Nepali Dashain greetings, happy Dashain wishes in English, Nepali Dashain, Bijoya Dashami wishes, Dashain greeting card, Dashain wishes in Nepali language, Dashain greetings Nepali, Dashain wishes in Nepali, Dashain wishes English, Dashain card, Dashain Subhakamana message in Nepali, Dashain message, Dashain SMS, Dashain wishes SMS, Dashain wishes card, Dasara images, Nepali Dashain greetings, Nepali Dashain wishes, Dussehra wishes, happy Dashain, happy Dussehra wishes, Vijaya Dashami greetings, Vijaya Dashami wishes, Nepali Dashain festival Wishes. (......) सालको पावन-अवसरमा सुख-संवृद्धि तथा दिर्घायुको कामना गर्दै बिजया-दशमीकाे हार्दिक मंगलमय शुभकामना ब्यक्त गर्दछु !!! दुर्गा भवानीले हामी सबैको कल्याण गरुन !!! Aaja ko din Nepali Daju, Bhai / Didi ,bahini tatha Sampurna pariwar harule dashai ko tika jamara lagai khusi saat khusiyali manai raheko dekhera malai sarai khusi lagyo. Tapai haru ko Dashain subha khusi khusi bitos. yaha haru ko sampurna pariwar haru lai vijaya dashami ko subhakamana. Yehi nai cha mero Dashain ko subhakamana !!! Yehi nai “Dashain” ko Shuvakamana !!! Happy Nepali Dashain 2019. !! !